Living in Brooklyn and need an honest, reliable Roofing Contractor? Contact Skyward Roofing, we are close neighbors that desire to provide clients with Budget Friendly Roof Repairs that correct all problems or Visually Stunning Roof Replacements in any roofing style desired. We work with developers, home builders, and commercial property owners to offer roof replacement services. All specifications are followed to the standards required for each type of roof by the industry safety of the buildings dwellers is a paramount consideration that we will not compromise. We are dedicated to building safe, durable, energy efficient and attractive roofs for all our clients. A property owner will generally at some point have to replace a failing roof. Although a roof replacement is costly and time consuming, it does give a better payback when selling a home then an awesome updated kitchen because basic maintenance is a necessity and must come first. Selling a home with a failing roof only brings to the forefront of home seekers minds "what else is wrong?" Residential Roofs in antiquity have used materials from sod, thatch, clay tiles to stone with stone lasting the longest. However, stone is limited to a short width which it can safely span without requiring pillars in-between. Wood framing is more versatile in ability to span greater widths with advances in architectural science. Our passing centuries have partly been a search for the safest and longest lasting roofing structures. Most notable would be the beautiful long-lasting slate roofs started in the 13 century. The newest type of roof to grace modern society are green roofs. Green roofs have waterproof membranes with at least an inch of soil on top to sustain a living plant based roof. Green roofs are very expensive and do require a gardeners care. 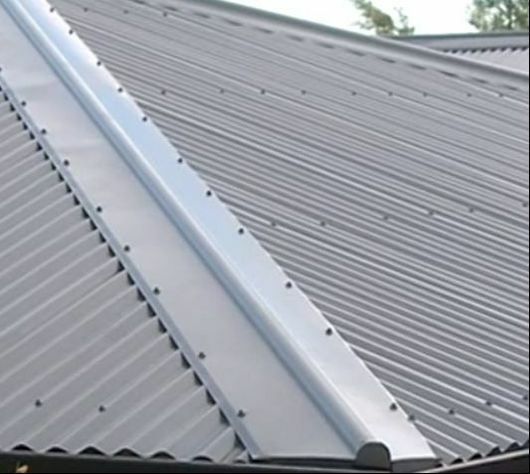 Metal Roofs to can bring to mind rusty bent or pitted tin roofs but in the last few decades metal roofing has produced several different styles of metal panels or tiles. Some look like sleek metal pieces that bring an elemental soothing look and others look like a traditional slate or cedar roofing material. The modern world is so full of roofing choices that make it rather hard to pick just one. Consider the irritation of clients constantly getting dripped on by ponding water from the roof in your business or walking around standing buckets- not a very good look for a responsible business. Mold and mildew, another unwelcomed natural phenomenon, can always be expected with standing water. Because mold and mildew spores are floating everywhere unseen in our atmosphere, it only takes is a water source to make them bloom. Imagine! customers having to plug their noses against a vile mold and mildew smell in your business. Unpleasant shopping experiences because of lax building maintenance may send clients to competitors’ due to worries over your professionalism. 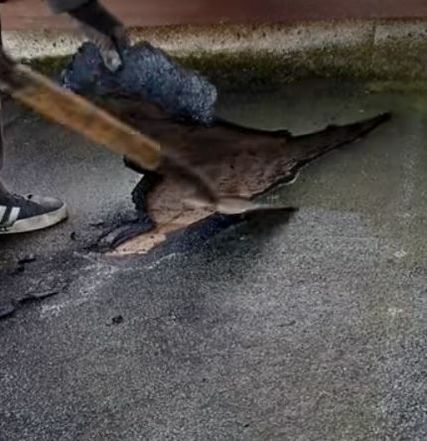 Most flat roofs need replacement at some point because when new leaks are appearing with every storm or once a roofing membrane becomes brittle or splits, it’s really time to consider replacing the roof. Skyward Roofers have been trained and rigorously tested in the implementation of flat roof systems common to this environment- paying particular attention to safety codes for each style. Many State Codes have requirements to be maintained for public safety due to local climates and geographical issues, some are wind resistance, fastening of roof membranes, fire resistance and strength to withstand the weight of snow, ice and slow draining water. 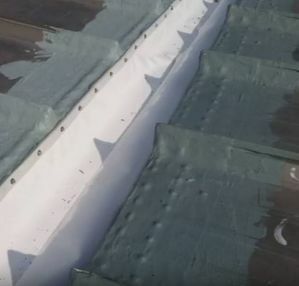 Leaks on a commercial roof can sometimes be fixed easily, for example debris on the roof may have penetrated the waterproof membrane, drains for water removal could be blocked, and vent or pipe penetrations may need caulking. Others take more experience roofers to track down elusive leaks or faults (like mold infestations), layers of the roof may need to be peeled back to find the split in the membrane, clogged drain pipes may need to be disassemble to be cleared, and Pest control may need to be engaged. 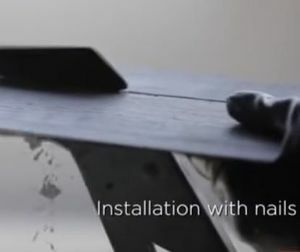 Slate Commercial: Slate preforms well as roofing because it can be cut into thin sheets, its very dense structure makes it moisture repellent and withstands freezing and thawing. It has been used as roofing since the 13th century and can easily last 175 years or more. Churches and government building managers are more concerned with longevity than a residential homeowner because these buildings are used for generations in the same community than the typical residential home that will pass through many owners in the same time period. A Slate roof is the longest lasting roofing material available and does look stunning on historical roofs. TPO (thermoplastic polyolefin) is a waterproof single ply roofing membrane installed with easily on most flat roofs. 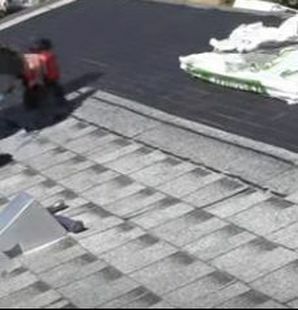 This type of rubber roof membrane is the least costly compared to others like PVC. Doesn’t encourage the growth of mildew of algae which means pressure washing isn’t necessary. They also resist corrosion but do absorb grease and oil (though the membrane will stain) which is better than PVC rubber membranes that upon contact with greases and oils will corrode becoming hard and brittle. EDPM Rubber single-ply roofing membrane: EDPM stands for Ethylene Propylene Diene Monomer which is a rubber like material. 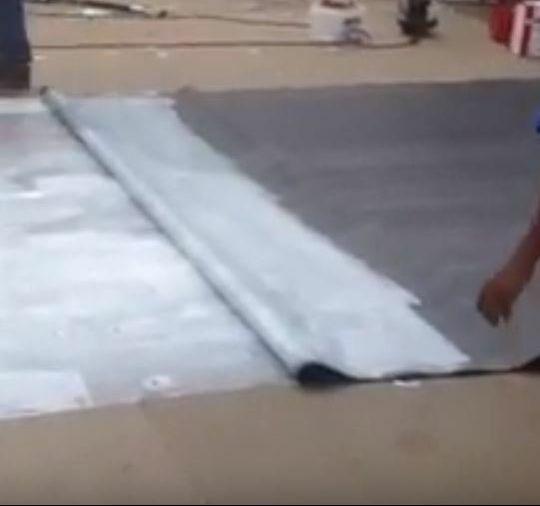 It can be installed as a complete monolithic membrane or in the case of a very large roof it can be installed with seams that are sealed with specially formulated tape or liquid adhesives. We encourage top metal roofing employee performance with continuing education to increase job skills, rewards for error free installs and refreshers of safety protocols. 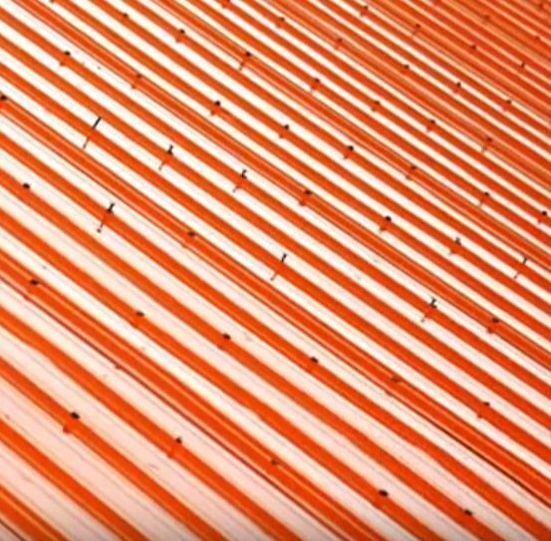 Metal Roofs on commercial buildings appear on industrial manufacturing businesses, such as metal fabricators, warehouses and airport hangers. Metal roofs are light enough to span great widths, without a lot of reinforcement, which make them budget friendly. Plus, for industries that do a lot of welding creating metal structures, such as store shelving, hauling trailers, fencing and many others there is less chance of fire spreading by sparks from welding torches. Metal Roofers are best when they have random crew leader or owner inspection checks to make sure installation or repairs on a metal roof follow established codes and standards. Skyward Roofing does employ random quality inspections. 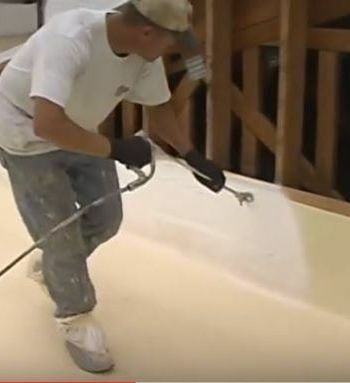 SPF (Spray Polyurethane Foam Roofing): Insulation foam roofing was developed from the insulation foam used by the military in the 1940 applied to airplanes. In the 1970’s, SPF started to be used as an improved insulation, and after years of development has become a successful long lived flat roofing system when given a coating to improve its resistance to UV- rays and protect it from minor impacts. Skywards Roofing provides superior customer service with a totally, commitment free, high-quality roof inspection. Our free roof inspections are carried out by our most experienced roofers in order to provide potential clients with, hopefully, several workable options. Our Inspectors goal is to offer clients estimates for repair or replacement of a problem roof with an affordable bare-bones solution approach including other solutions providing upgrades that may be advantageous a client’s unique situation. Novice inspectors don’t have the extensive background working through roofing solutions to be able to propose them. ​Most large commercial building’s roofs are flat partly because mechanical building components (HVAC, fire sprinklers and firestops) can be placed on the flat roof thereby increasing the usable space within the building. Plus, they are cheaper to build (less building material required), less volume of useless attic space and less space to condition. Flat business roofs we repair or replace are TPO membrane, metal roofing, EDPM or Rubber membrane and spray polyurethane foam. Most commercial flat roofs experience wear and tear through the years and will leak, pond water, form blisters and ridges, develop surface erosion and … Before you send one of your employees up to take a look at a leaky roof, keep in mind you are responsible for their safety which is in jeopardy because they do not have the training or equipment to complete what you ask. Also, the roof deck could have enough rotting substrate to send an unwary employees foot crashing through it or worse yet the employee themselves. Using an inexperience person to diagnose a problem, may send you in the wrong direction wasting more time and money than needed. Often many improper repairs, using wrong materials to repair a roof, cause more problems resulting in further costly repairs. Many novice maintenance workers, business owners and handymen fail to correctly repair TPO roofs for several reasons, such as: Repairs fail to bond or seal well because the surface hasn’t been prepped right. The original membrane surface has to be cleaned spotless to accept the repair patch. The right materials are not used. 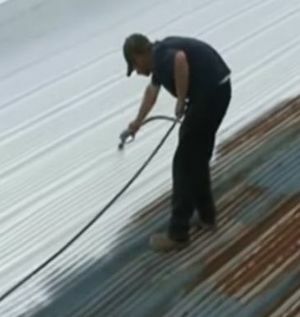 To seal a hole in a TPO roof, specialized equipment is needed, such as left over original TPO material that can be used as a patch or equivalent and a hot air welder. Hot air welders are expensive and most building maintenance personal just don’t have one- let alone know how to use them. 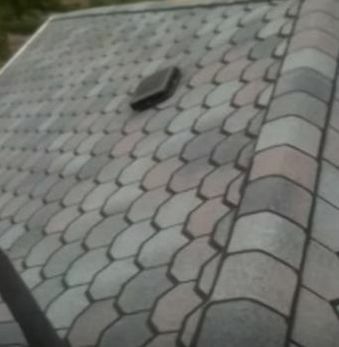 Also, buying a small patch of TPO roofing material is difficult because most TPO roofing material manufacturers require buyers to buy a lot more than one small replacement patch- this could make an inexpensive repair a lot more expensive. Replacement of an ageing TPO membrane. When the TPO membrane becomes very old, the top layer of it will shrink, crack, craze and generally deteriorate. 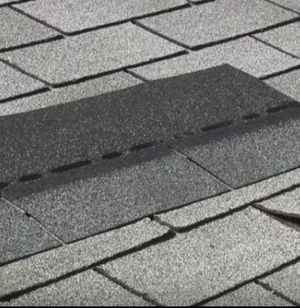 If the roofing membrane has numerous cracks and has pulled away from the seams, then it may be time to replace the membrane. Generally, most roofs can handle two layers of membrane. However, it may be best to know if there is moisture damage underneath. The insulation on top of the roof deck may have decay problems from possible moisture damage and need replacement. The wood framing underneath the insulation may have also developed rot and need repair. No Cost Roof Inspection, at your convenience, that will evaluate the functioning of your buildings roofing system. We will arrive on time at the site on the scheduled date. The inspector will first discuss your concerns, and take notes during the meeting to make sure we address all of them. We will also ask for any known history of the roof in case that previous repairs may have been done badly. We follow a multipoint checklist during the commercial roof’s assessment, some are points of deterioration, compromised accessories in need of repair, safety concerns, debris removal, and decay or mold remediation. Debris will be examined to determine where it originates. 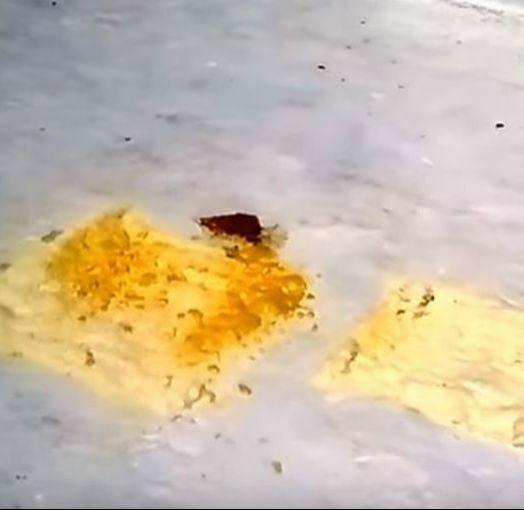 Whatever drops on, crawls on and blows on a flat roof will stay till somebody takes it off. Trees overhanging the roof should be cut back to prevent the dropping of foliage or branches, and to remove critter access to the roof. Also, not allowing employees to use the roof top for breaks will prevent littering and wear and tear to the roof membrane. The idiom “A roof over one’s head” is indicative of how important roofs are to protecting us from weather, insects, and other animals. This is no less true for commercial roofs which allow us to conduct business in a protected environment. 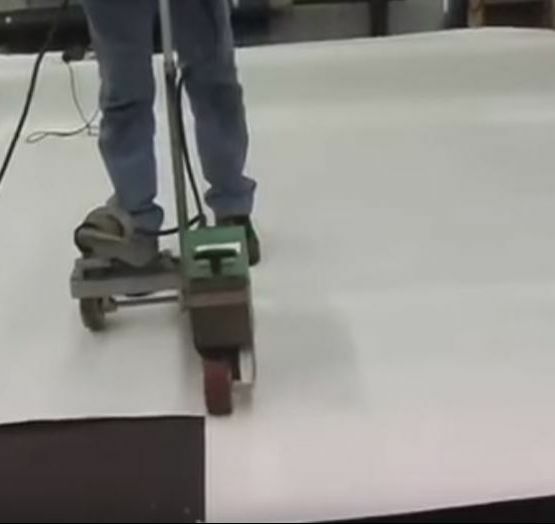 Rubber Membranes are made of natural rubber or EPDM (ethylene propylene diene monomer) and are rolled, carpet like, into a flat covering membrane. These membranes are available in two colors white or black and both types resist sun damage. The white color is about 30% more expensive due to its heat-reflecting properties which is more energy efficient. Since this is like laying a quilt over a roof, it’s subject to wind damage- even going for a liftoff in high wind. 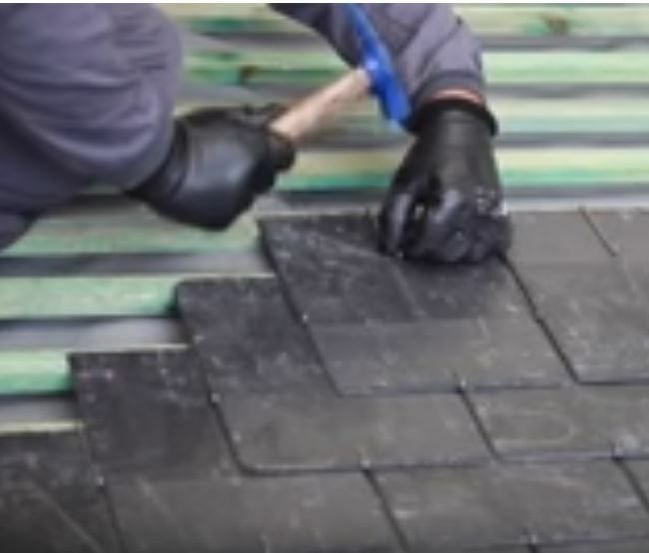 The material has to be mechanically fasten with long screw like anchors, adhesive, or placing a layer of gravel on top to keep the public safe from large flying sheets of rubber. Repair of a leaking EDPM Roof is sadly quite often needed because of previous installation or repair errors. 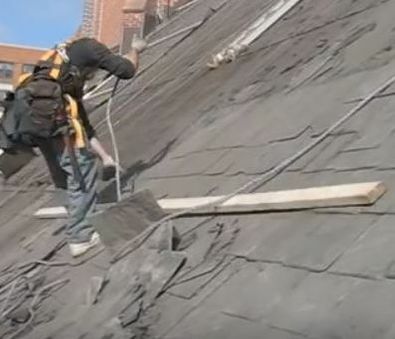 Our excellent roofers will often check previous repairs first. For example, installing a gravel stop drip edge on a EDPM roof produces ponding at the roof edge. In New York where ponding of melted snow constantly undergoes a freeze then thaw cycle. This freeze/thaw action will work seams open over a short period of time- especially if there is a wrinkle in the membrane. 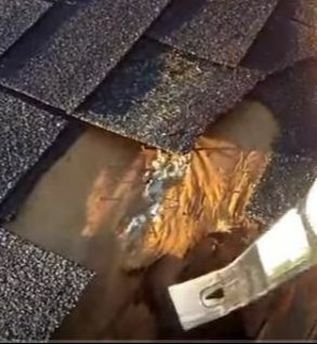 The moisture damaged drip edge will decay the roof’s edge till it gets your attention as a roof leak. 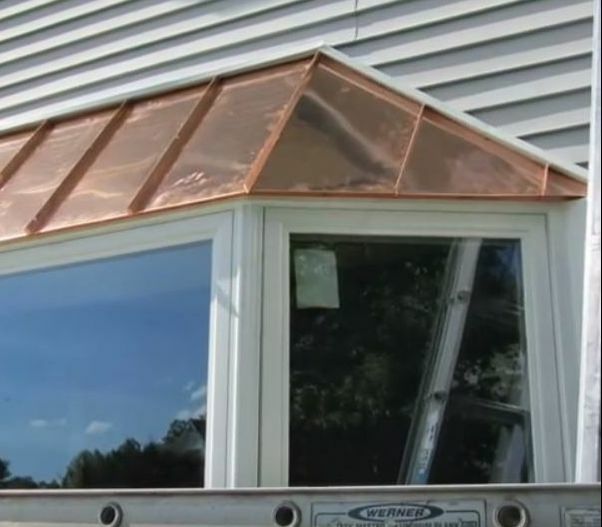 However, don’t be worried that only a total replacement will fix the leak- many problems can be repaired without a total replacement by our clever and creative roofers. Our roof inspectors are some of the best in the roofing industry because not only do they have years of experience but also receive training in the ever-evolving roofing material improvements. Replacing an EDPM may be needed because of horrible extensive wrinkling resulting from a novice install or vast wind damage to the membrane. Unlike other flat roof membrane systems that become brittle over time due to UV rays, EDPM maintains its strength and flexibility so any improving modifications are easily made. The membrane should be washed well before any attempt is made to cover it with repair patches. Some of these roofs are still functioning 50 years later with regular maintenance. Non-construction type employees are generally clueless about the workings of a Flat Roof system and may have a great deal of trouble trying to accomplish an inspection or least a worthwhile one. The worst part could be the dangerous situation you’ve sent your employee into: They could trip over loose cables, cut themselves on sharp edges of mechanical building components or slip on spots of wet slimy mildew. 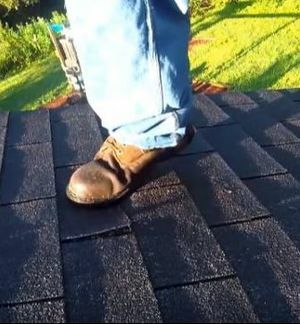 Commercial Roofers are knowledgeable about the dangers on a roof top, and they are dressed in non-slip boots, leather gloves and proper clothing to protect against cuts and falls. We will rapidly, at a clients request, send an inspector to your business to investigate a roof leak. They will work quickly to minimize water damage- saving you some of the secondary costs, such as inventory, equipment, and structural damages. Finally, our assessment of the building’s roof will determine the reliability of the roof’s system- bring to awareness any other potential failures. Metals roofs, in the not so distance past, brought a vision of rusted metal panels on barns or storage sheds, standing seam commercial application or a bumpy tin metal roof on a rather ramshackle shack. In modern times, they have several styles that look like sleek smooth metal tiles or panels, cedar wood shakes or shingles, clay tile and slate tile. There are so many styles available they easily exist in beauty on a Spanish Colonial, Modern/ Traditional Church, a Victorian in New York, or numerous other dwellings. The point being, metal roofs offer excellent faux looks. Metal roofing is also very versatile able to function well on a great many roof slopes- from low to high. Homes, Churches, Industrial Complexes, Businesses... any dwelling use metal roofing sheets made of steel, aluminum, or copper because of its rugged composition and mellow beauty. It's versatility is exploited by roofing manufacturers to produce a wide range of quality options of roofing styles that complement all types of buildings which is why they are installed on the most humble of structure to those of impressive grand design. Steel is fashioned into rolls of 24 or 26- gauge sheets. The higher the gauge number the thinner the sheet, for example most stainless-steel sinks are 18 gauges. To prevent rust the steel is given metallic coating of zinc (galvanizing) or a mix of aluminum and zinc (galvalume or zincalume). The galvalume coating offers the longer service, but all coatings are offered in various thickness- the thicker the better and of course the costlier. The sheets are finished off with a baked on painted finish that comes in many colors and finish qualities. Copper is often called a natural metal as it is neither coated or painted because it weathers without rusting to a much-desired green patina. 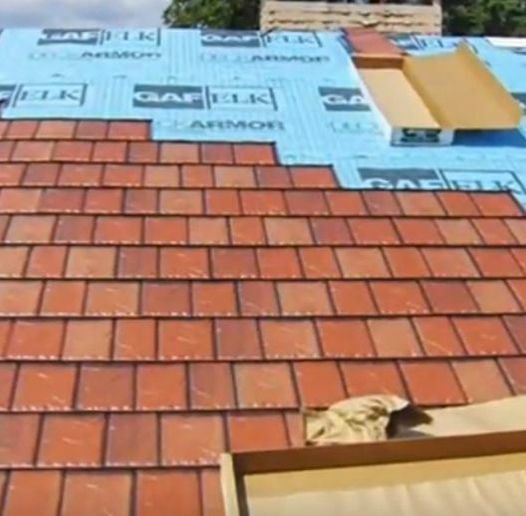 Metal shingles are usually made of common metals, such as galvanized steel, aluminum and to a lesser extent copper and zinc are manufactured with a stamping press. They come in many styles (natural slate or cedar) and colors. 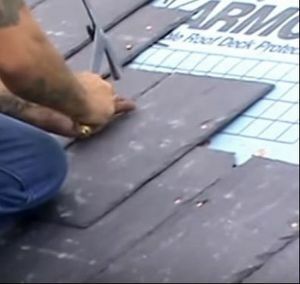 The low-profile shingle allows the roofer to walk on them during the installation without damage which makes them a little easier to install than the more easily dented panel type. They are made to interlock with other shingles with nails going in at one corner to hold them to the roof. Metal panels come in 3 options a foam insulation backed panel, exposed fastener and seamless interlocking panel. Speed of installation is quick especially with the larger panels. Caution: Large panels of metal roofing will expand and contract with the weather so they need to be installed with special fasteners to allow this movement. Metal Roof Leak Repairs need to be fixed with a proper screwed down metal patch. 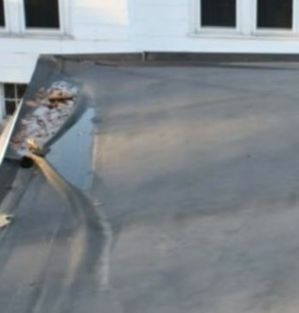 Most leaks occur at flashings around roof penetrations, seams or panel fasteners backing out. Unchecked Oxidation will also lead to roof leaks. The passing of years, sometimes gives screwed down fasteners the tendency to back out of their seated position- probably due to wind uplift vibrating the panels. Metal roof inspections should check the tightness of the exposed fasteners. 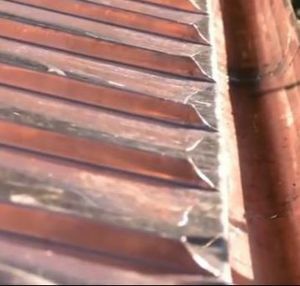 Repairs to holes in metal roofs may fail because of the different rates of expansion and contraction between the repair and the rest of the roof. 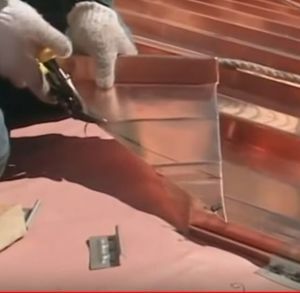 To patch a hole in a metal roof, a somewhat bigger- yet still round piece of the same metal will be attached on top of the hole with sealant and pan-head screws (screws that are flat on top but rounded on the sides). This patch will be long lasting if done with care. However, patches should be inspected once in a while to repair any cracking or splitting around the repair- request inspections 2 times a year to stop problems before they become disasters. Sometimes to prevent holes you'll need to call a pest control company Hopewell. Oxidation on a metal means the protective coating has worn away. 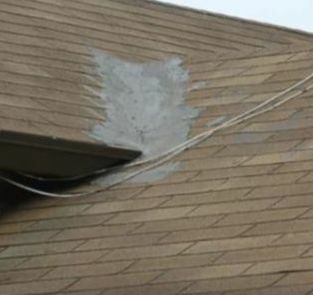 The oxidation damage, if there is no hole, can be wire brushed or sanded out than repaired with metal primer followed with paint the same color of the roof. After repairs are completed Skyward Roofing recommends a protective coating be applied to the roof’s surface to add considerable well-functioning years to the roof. Metal Roof Replacement will eventually be necessary when the frequency of leaks increases to several times a year. Also, a run-down metal roof showing obvious craters or extreme waviness will require replacement because it may no-longer have the strength to stay attached in a strong wind- making it a danger to pedestrians. Note: most code requirements across the USA will not allow more than two layers of roofing before a complete tear-off is required. Even if, you have a 2-layer shingle roof and you want to install a metal roof, which is much lighter than asphalt shingles, a tear-off is still required. Free, No Strings Attached Metal Roof Repair or Replacement Cost Estimates. We inspect and service all types of metal residential and commercial roofs in the Bronx or the surrounding boroughs, such as Yonkers, Queens and beyond. You have nothing to lose, by requesting an inspection, but a little time, and will receive in return a cost estimate to repair or replace your metal roof- half the worry is wondering how much something will cost. We require no monetary outlay or preset conditions only access to inspect the troubled roof at your convenience. We will inspect the problem roof to discover the absolutes that need to be fixed and discuss options and possible upgrades (protective roof coating) you’ve expressed an interest in. Within a short time, the inspection will be followed up by a detailed written report explaining the health of your roof, potential problems, estimate of its additional life expectancy and finally budget friendly solutions to problems found. This report can be hand delivered, texted or emailed whichever works best for you. 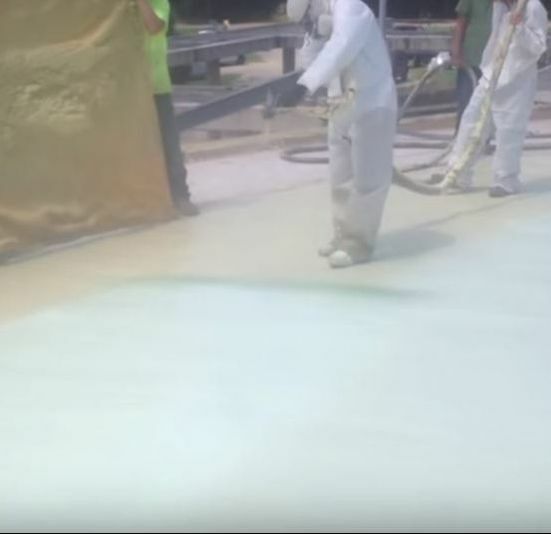 Polyurea coatings are the preferred top protective coating for a SPF roof. 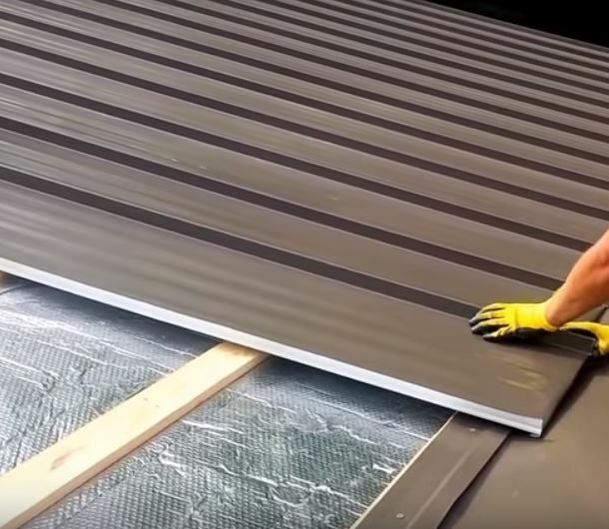 Together Polyurea coating with the energy efficient foam insulation layer on top of a flat roof will reduce energy bills and seal tight against leaks around flashings that are a weak point in other roofing systems. This coating will even protect against ponding of water which happens quite often on flat roofs. The spray is also formulated with non-fading UV resistant colors to avoid heat transfer into the dwelling below. 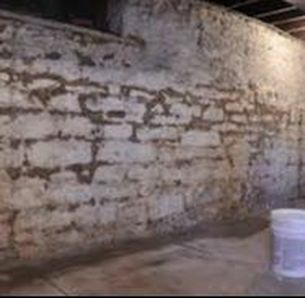 Polyurea Waterproofing for basements and foundations: Many neighborhoods in New York City have very little wiggle room to spread out to build storage sheds in yards to store necessary yard tools, Christmas supplies, home repair tools… so we look to our basements for such storage. However, wet basements will cause rust to eat away at tools, mold to settle on treasured decorations and will only get worse the more we pack the area up. To keep our storage items safe from decay in our homes basements, we need to control water intrusion. Skyward Roofing has an affordable solution to dry out these basements and clean up the air quality in the rest of the home using methods design specifically for each homeowners’ unique situation. Estimates for Polyurea Waterproofing can be prepared in 24 hours, but sometimes in complex environments it may take a few days. We need this extra time to factor in additional methods to arrive at the same conclusion a dry basement or flat roof top. A detailed written report will be submitted personally, email or postal service (your choice). The estimate will explain what has to be done to provide a long-lasting waterproofing to correct all paths of moisture infiltration within a budget friendly format. We will not advise costly solutions when less costly ones are suitable.